European style accommodation. Private rooms with shared bath. Rooms include free WiFi, a double size bed suitable for two people (children under 6 stay free, one maximum per room), a sink lavatory and cable television. We have a 24 hour front desk to provide extra security. Rooms come fully furnished with either laminate wood flooring or tile flooring with night stand, dresser, headboard, and work table with chair. Brand new showers with a total or two per floor as well as two toilette's. You can go in and out 24 hours no time restriction. Charges may apply to some facilities offered. Credit card required to book reservation. Please note we pre authorise the full amount 48 hours prior to arrival to guarantee your room. Failure to pre authorise may result in your booking being cancelled. Maximum 3 people per room including children. Children under age 6 free. No roll away beds available. Extra person is $15 per night. We do not have extra beds or space to keep extra beds. Considering the fact that you usually stay at a hotel to sleep, this place did it! 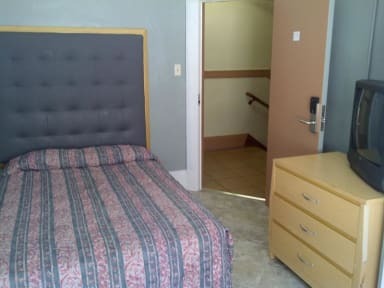 Many others may consider the homeless as a negative point, however, they do a really good job at protecting their guests by keeping the place secure, I will consider this place for future occasions if I need to be close to everything in the city. The folks that run the place are very helpful and customer service oriented. Thank you. Sketchy area in downtown but very convenient. Room has a sink only, and very quiet - even with all the noise on the street the rooms are quiet. Toilet facilities and shower facilities are at the end of the hall. Staff are nice and helpful. I stayed there a year ago and it was much improved this time. They are doing significant renovations and it shows. The street near the entrance has a large number of homeless, but I never felt unsafe. The staff were friendly and helpful. The location is close to downtown and a block away from the Powell St. stop for the BART train. There are plenty of good restaurants in the area. Worth the money. Just pay a night for sleeping. The price is close to pay for a shared-room in hostel, so I dicide to stay here in my own room. I think they remodeled all room, it’s new and clean. SF at night is so noisy, just shut the window down and turn on the fan. The area at night also not safe but there’s nothing as lot of people walking around. Staff is helpful and friendly. Nice and tidy place, rooms in fairly good condition. Showers and toilets cleaned multiple times a day. Immediate area a bit dodgy with lots of homeless people around, but they were all friendly and didn't bother us even at night time. Definitely good value for money. Good if you are on a budget however area is not very safe, lots of homeless and drugs delt at the door step. However it is on the very edge of the dodgy area so if you get Uber to the door and don’t walk around at night then it is totally fine! Floors are creaky and bed was full of springs and very noisy when you move on it however you get what you pay for. Overall would go back again however just don’t expect 5 Star. Staff were helpful and shared bathrooms were always clean. 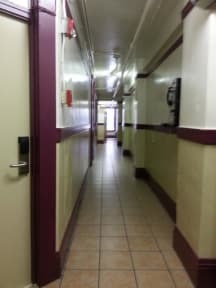 The hostel was clean and well run, but unfortunately the location in San Francisco felt unsafe to my daughter and myself. Many folks with aggressive mental health problems, and lots of people on the street who were homeless and/or drug addicted, with drug use and needles in public. While we were across the street at CVS, there was an attempted robbery there by a man with a knife. Would not recommend this place to anyone except the toughest and most street wise. We only stayed one night. eh. For the price, the Winsor is not a bad option. Rooms were uninspiring. 1 shared toilet for the floor, and the fluorescent lighting was either insanely bright or nothing. Situated in a neighborhood with a lot of hunger and homelessness, open drug use, and always some random yelling just outside during the night. Staff were helpful and responsive. Pizza shop next door, and a great little coffee shop just down the block. Awful stay and awful staff. Don’t stay here. A homeless man harassed us just out side of the establishment.